When you slather lotion onto your body, light a match, or scoop laundry detergent into your washing machine, you probably don’t think about where the materials to make these products came from. 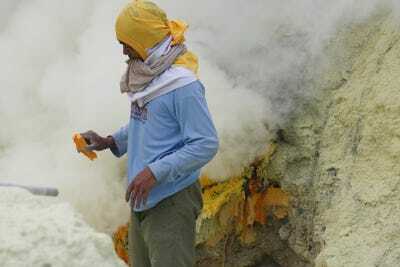 But in reality, hundreds of people risk their lives each day to secure a necessary ingredient for a variety of goods: sulphur. 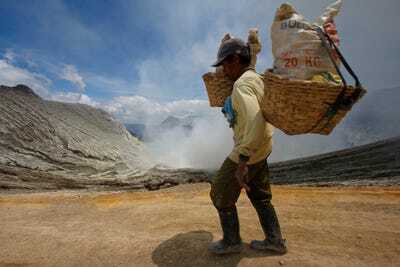 Every day, Indonesian miners scale a volcano on the island of Java and collect thousands of pounds of sulfurous slabs, which eventually are exported to China and Southeast Asia. The work is extremely dangerous, and gases from the mine “singe the eyes, throat, and lungs and can even dissolve teeth,” National Geographic reports. 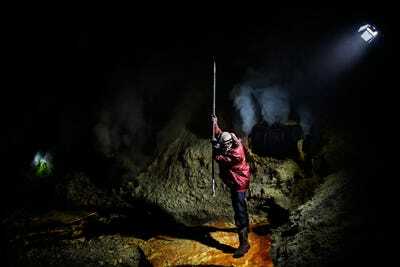 Photojournalists such as Italian photographer Luca Catalano Gonzaga, Reuters photographers, and others have spent days in the belly of the mine, capturing the literally back-breaking work and horrific conditions associated with the job. 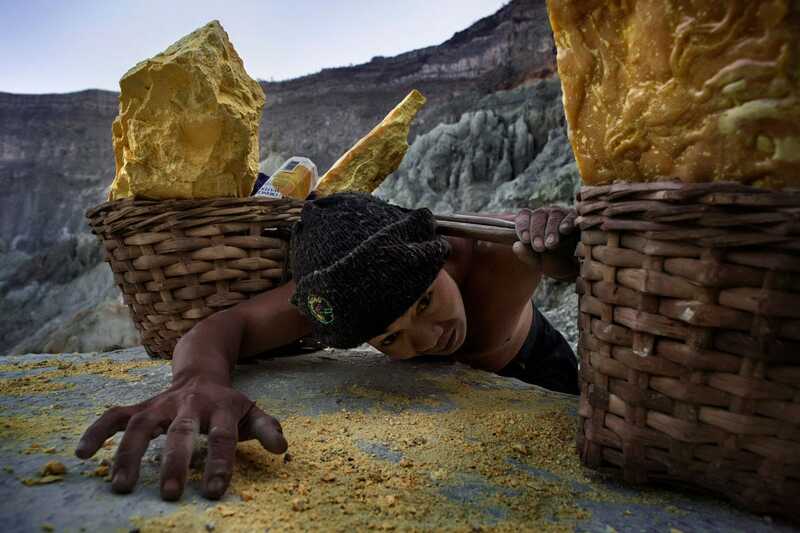 Here are 36 photos that illustrate the treacherous life of a sulphur miner in Indonesia. 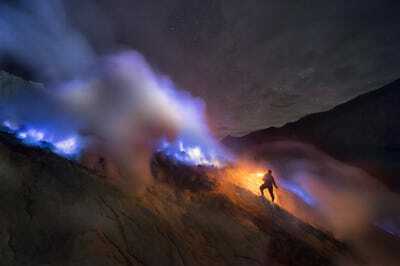 The Kawah Ijen volcano lies in East Java, Indonesia. 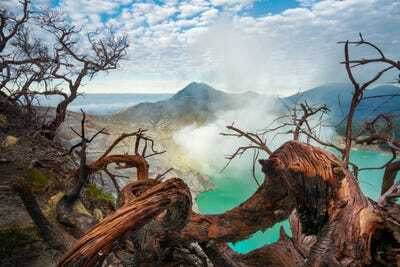 The mouth of the mine sits near the foot of the crater, which holds a pool of turquoise water. 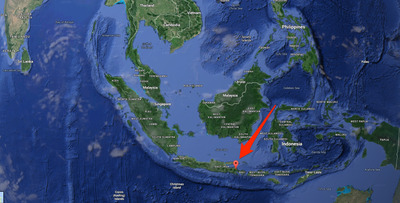 The volcano is part of a complex of steep, conical stratovolcanoes in the Banyuwangi Regency of East Java, Indonesia. 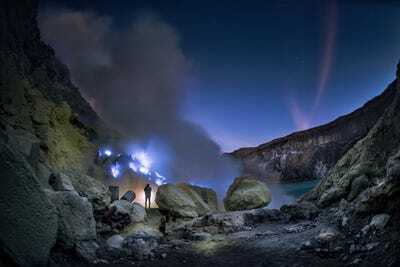 But it is actually the light emanating from the combustion of sulfuric gases. 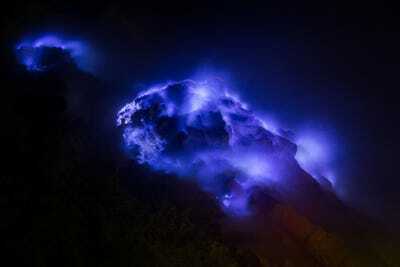 The high temperature and pressure of the sulfuric gasses react with air to produce the faint blue light. This 'lava' of liquid sulphur floods into the mine and eventually hardens into a precious cake of yellow sulfurous material ripe for the picking. 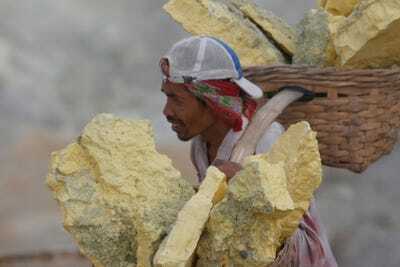 Every day, about 300 workers make the two-mile trek up the steep and rocky quarry walls. 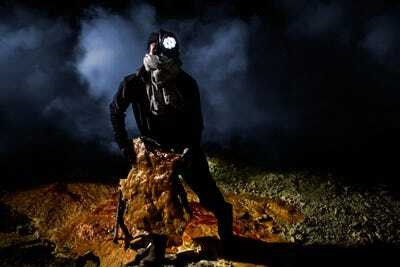 Then they plunge about 3,000 feet into the 'womb' of the volcano to extract the materials with metal poles. The miner's call the sulphur 'devil's gold' because the conditions inside and outside of the mine are extremely dangerous. Those who can afford them wear proper masks. 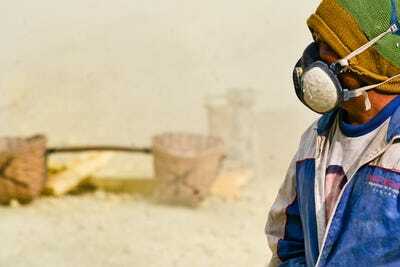 Many workers just try to get by with makeshift, and often unsatisfactory, face shields. But no such limit for the miners exists. 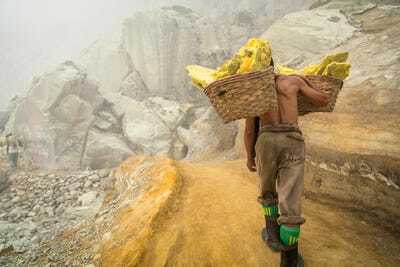 Worker carrying sulphur on Ijen with smoke. 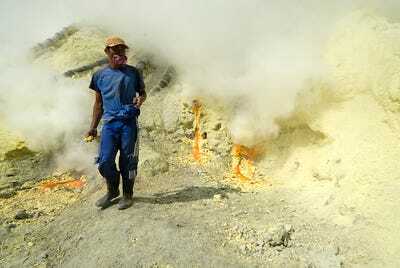 The mine also generates scorching heat, which causes some to work at night when the conditions are cooler. 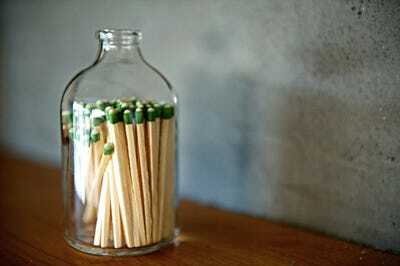 But fumes aren't the only source of misery. 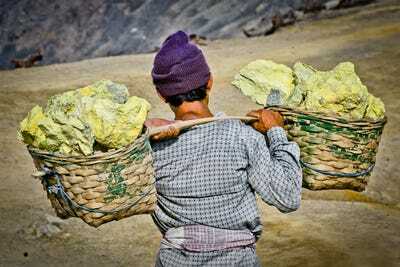 Miners often suffer mangled and lesioned backs, deformed spines, and bent legs from the heavy weight of their load. Their fully loaded packs can weigh up to 200 pounds. 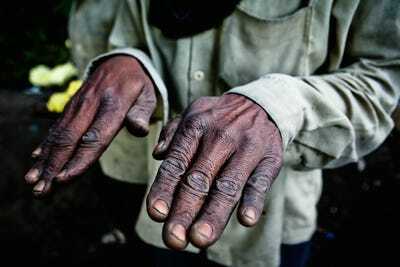 And thick callouses and heavily-creased skin often mark sulphur miner's hands from gripping the wicker baskets. 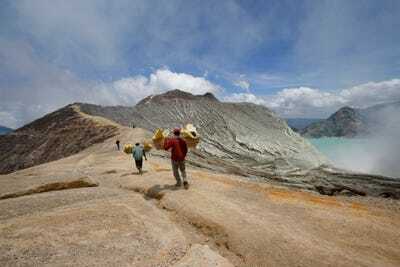 These injuries often arise because sulphur miners don't take time to rest and recover after carrying their loads from the volcano to base camp. And an average life expectancy of only 50 years. Because of the extreme occupational hazards of the job, miners discourage their children from following in their footsteps. But sometimes they have no other choice. 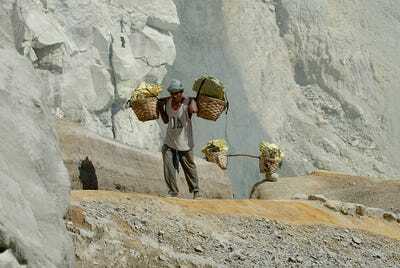 If they can manage two trips in a day, miners can make about $10. A meager salary compared to the horrific occupational hazards associated with the job. 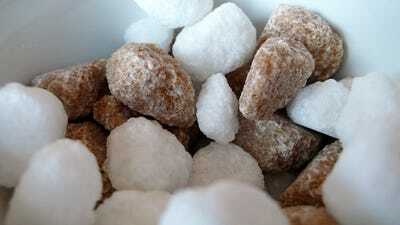 Including cosmetics, medicines, and explosives. 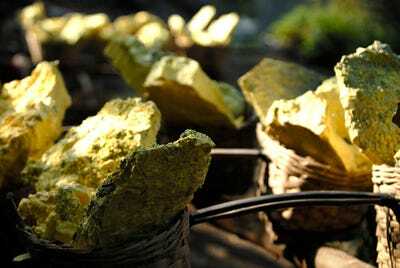 About 13 tons of sulphur are pulled from the mines every day. 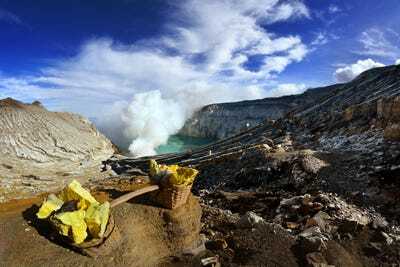 Until the late 1800s, there were sulphur mines in Italy, New Zealand, Chile and Indonesia, volcanologist Clive Oppenheimer of Cambridge University told The BBC.